It’s a big weekend with an ever bigger football game on Sunday night. There’s a good chance that you will be getting together with some family and friends around a large flat screen television to watch, to shout, to root for your team, to watch commercials, and, of course, to share a meal. This chili will be perfect. It makes a lot, but like so many very flavorful creations, it’s great the next day and keeps getting better with age. The ground turkey is lean, the onions and peppers are good for you and the beans have all kinds of good things in them. So, prepare this today and enjoy it tomorrow. Don’t forget the Bean-o. Really, don’t forget. Bean-o, optional. Or maybe not. Place a large soup pot or Dutch oven over medium heat and add the extra virgin olive oil. When the oil is warm, add the ground turkey, browning it and breaking up the clumps as you go, about 4 minutes. Season with kosher salt and fresh ground cracked pepper. Add the diced onions and sauté for 3 or 4 minutes. Add the red and green bell peppers and cook, stirring occasionally for about 4 minutes. Add the spices: chili powder, cocoa powder, cayenne, allspice and cumin. Let this cook down for 3 to 4 minutes. Add the crushed and diced tomatoes. At this point you’ll have to be the judge as to the consistency. 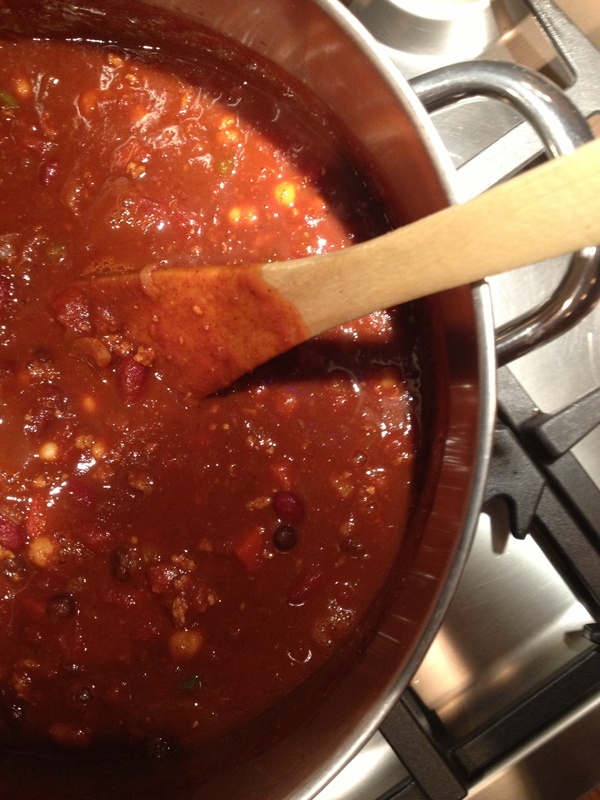 If you like thicker chili, you may be good to go at this point. If you like a little thinner consistency, add V-8 juice to your liking. A great tip from my sweet mom’s kitchen: the cans of tomatoes and beans will likely still have some of the juice in the cans. Take about a cup of liquid—the V-8, or water, or even white wine and pour it into one of the cans. Swirl to clean the can and pour into the next can. Swirl and pour into the next can. Rinse, repeat, rinse, repeat, rinse, repeat… you get the idea. No sense in letting all of that good stuff disappear down the drain. Let the chili cook over low, low heat for a couple of hours. If you prepare this a day or so ahead of time, it will be all ready for the big game on Sunday night. Serve with whatever you like to eat with chili… cheddar cheese, sour cream, green onions, bacon bits… Enjoy! Serves a crowd—about 12 people.